A sampling of shots of the energizer-bunny of the prairie grouse world. Named after the narrow look of their two central tail feathers, they are also known as firebirds due to the fire-adapted grassland and brushland habitats they prefer. These photogenic birds are quite popular with wildlife watchers because they often ignore blinds which can be situated quite close to display territories, and their energetic, almost humorous breeding behavior is fascinating to watch. These birds can be quite faithful to their display grounds, and their display is a mixture of dancelike foot stomping and tail rattling, with cooing, chuckling and popping vocalizations, as well as a few "flutter jumps" mixed in. But if you want to experience this wonderful product of biological evolution, you need to plan ahead, not unlike hunting trips, get out in the blind at least one hour before sunrise, and plan to stick it out up to 5 hours before they leave for cover during mid- to late- morning. Peak breeding and display activity occurs from late-March through late-April on display grounds known as leks, after the Scandinavian word for playground, and their dancing and displaying is known as lekking. While this species used to be more widespread, aggressive management of the grassland and brushland habitats by wildlife agencies and non-profit groups are helping to ensure a future for this species. 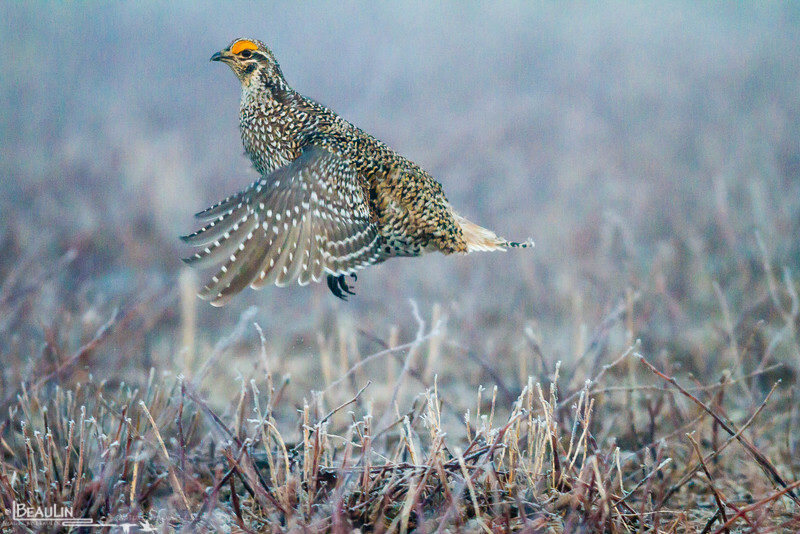 Flutter jump is a common behavior of male sharp-tailed grouse (also known as firebirds) when they get very excited on the lek, especially when the girls arrive. Not as grand as the flutter jump of a Prairie Chicken, but just as hard to capture with a camera!